Phillips Drive / Coarse Thread / Zinc Plated. Flat head machine screws have a flat top surface with a cone shaped bearing surface which is countersunk. This type of countersunk head leaves a flat surface once the screw has been driven in completely. Machine screws are most often used with a nut as a means of tightening unless they have a pre-threaded hole with the exact thread pitch. These screws are most commonly offered in smaller sizes. 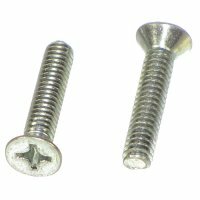 Other types of machine screws sold at NutsandBolts.com are: phillips round head machine screws, stainless steel flat head machine screws and stainless steel round head machine screws. Phillips head machine screws are the most recommended type of drive. A phillips drive offers more control and less slippage.